Helping you with your heel pain. Heel bumps (pump bumps or haglands deformity), a bone enlargement at the back of the heel bone or calcific enthesopahty. Bursitis - an inflamed / irritated bursa (small sack of fluid) at the back of the heel or bottom of the foot. Usually worse with the first few steps in the morning or at the end of the day. Walking, running, sprinting, hill running and jumping will increase the pain. Often, the natural response is to walk on the outside of the foot – in supination – to lessen the stress on the plantar fascia – resulting in new problems. This heel pain occurs in children aged between 9 – 15 year old children and is more common in boys. This pain is often worse with jumping and running, however if bad enough can be painful at all times of the day. The pain occurs when the Achilles tendon continually pulls on the apophysis of the calcaneum and does not allow it to fuse with the body of the calcaneum. This occurs when there is repetitive trauma at the attachment of the Achilles tendon, resulting in a spur from the calcaneum up into the Achilles tendon. It is usually visualized on x-ray and may be tender if there is an associated bursitis or tendonitis. Also known as Haglund’s Deformity, this is a bony enlargement that exists on the back of the heel – usually related to a congenital abnormality or with chronic bursitis, causing a thickening. There may have already been trauma or pressure from footwear. Treatment is usually protection of the bump and correct footwear. Associated with a symmetrical swelling at the base of the Achilles tendon. It is usually related to repetitive trauma or inappropriate footwear. It is often red and hot in the early stages. Treatment is usually to correct the footwear, provide padding and treat the local symptoms e.g. ice, rest, physiotherapy and cortisone injection. Direct contact with the base of the heel may result in trauma to the fat pad. Related to obesity, training on hard surfaces, uneven grounds, poor shoes especially overlarge shoes which can cause shearing forces on the heel. These conditions are renowned for taking a long time to recover – usually many months. Achilles Tendonitis causes pain at the back of the heel where the calf muscle attaches to the bone. Achilles tendinitis is one of the worlds most common tendon problems. Overuse, misalignment, improper footwear, flat feet and genetics and/or accidents can all result in Achilles tendon injuries. Calcaneal Nerve Entrapment is a medical problem that can result in heel pain. There is a specific nerve known as the calcaneal nerve that runs under the inside of the heel. 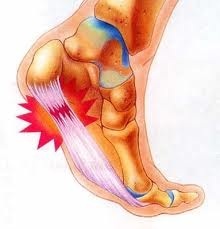 Sometimes this nerve can become entrapped and cause a burning pain on the underside of the heel. 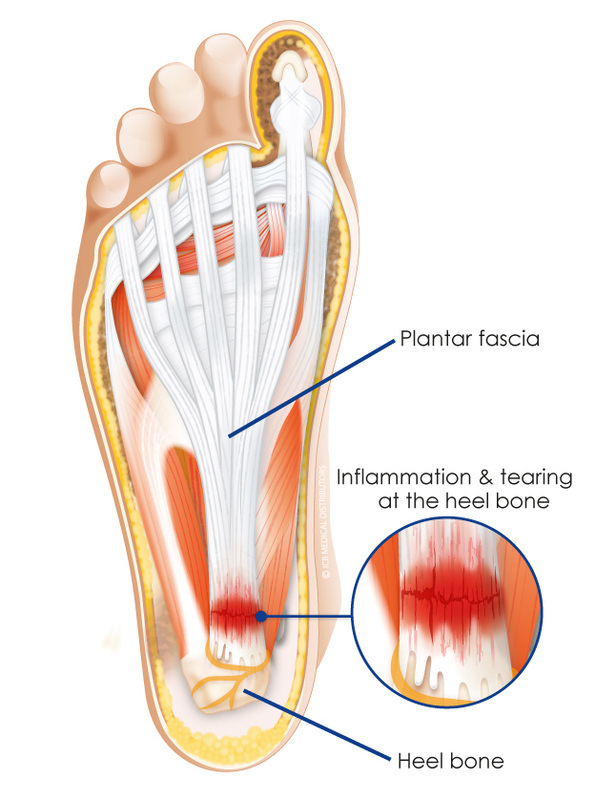 This pain is similar to the pain experienced by a plantar fasciitis sufferer, though heel pain from nerve entrapment will not get worse in the morning. Other soft-tissue or bony growths such as a tumors, infection, cyst's or gout. Bruises or stress fractures to the heel bone (calcaneous). Because there are number of potential causes of heel pain, it is important to have yours diagnosed by a Podiatrist who can distinguish between all the possibilities and determine the underlying sources of your heel pain. The greatest incidence of heel pain is seen in middle-aged men and women. It is also seen in those people who take part in regular sporting activities, people who are significantly overweight and those who are on their feet a lot. Heel pain such as sever's disease can occur in active children aged 9-13 years old. While heel pain has many causes, it is usually the result of biomechanics limitations (misalignments or abnormalities in the way we walk). This can place too much stress on the heel bone and the soft tissues attached to it. The stress may also result from injury, or a bruise incurred while walking, running or jumping on hard surfaces; standing for prolonged periods; wearing poorly constructed footwear; or being significantly overweight. Systemic diseases such as arthritis and diabetes can also contribute to heel pain. Wear shoes that fit well – front, back and sides – and have shock-absorbent soles, rigid uppers and supportive heel counters. Avoid flat shoes such as thongs or shoes with excessive wear on heels or soles. A good pair of running shoes is often recommended for people with severe heel pain. For more information on running shoes click here. Ultrasound, rest, thermal therapy such as RICER, heat therapy, and ESWT are only a small list of the treatments that may be used to help your heel pain. Your podiatrist may also use taping or strapping to provide extra support for your foot. Orthoses (shoe inserts) specifically made to suit your needs may be also be prescribed.